Vera Rubin, Astrophysicist Who Confirmed Existence Of Dark Matter, Dies At 88 : The Two-Way The astrophysicist's groundbreaking research on spiral galaxies provided evidence of invisible dark matter. She was a pioneer in an era when women were excluded from many astronomy programs. 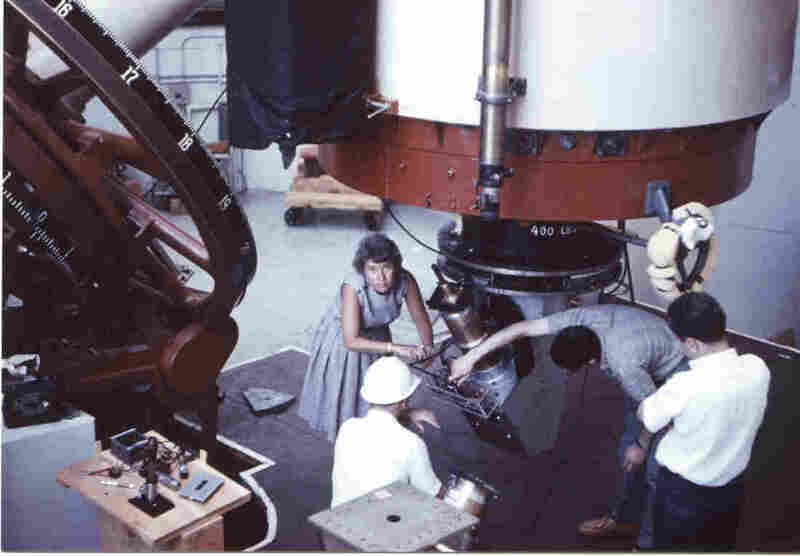 Vera Rubin works at the Lowell Observatory in Flagstaff, Ariz., in 1965. In the 1960s and 1970s, Rubin was working with astronomer Kent Ford, studying the behavior of spiral galaxies, when they discovered something entirely unexpected — the stars at the outside of the galaxy were moving as fast as the ones in the middle, which didn't fit with Newtonian gravitational theory. Adam Frank, an astrophysicist who writes for NPR's 13.7 blog, described dark matter by comparing it to a ghost in a horror movie. You can't see it, he writes — "but you know it's with you because it messes with the things you can see." "It was Vera Rubin's famous work in the 1970s that showed pretty much all spiral galaxies were spinning way too fast to be accounted for by the gravitational pull of the their 'luminous' matter (the stuff we see in a telescope). Rubin and others reasoned there had to be a giant sphere of invisible stuff surrounding the stars in these galaxies, tugging on them and speeding up their orbits around the galaxy's center." The existence of dark matter had been proposed by Swiss astrophysicist Fritz Zwicky in the 1930s, but hadn't been confirmed until Rubin's work. Now it's believed that more than 90 percent of the universe is composed of dark energy and dark matter — but dark matter remains "invisible" and "mysterious," NPR's Rob Stein reports. In addition to her groundbreaking work on dark matter, Vera Rubin was a pioneering advocate of women in the sciences. She was passionate about astronomy from the age of 10. Rubin once explained to an interviewer that it's not like she was planning on breaking into an all-male world. "I didn't know a single astronomer, male or female," she said in the interview, republished in her book Bright Galaxies, Dark Matters. "I didn't think that all astronomers were male, because I didn't know." But as her career advanced, the scarcity of women in her field was readily apparent. According to a profile of Rubin from Cosmic Horizons, she was the only astronomy major to graduate from the women's college Vassar in 1948. She was rebuffed by Princeton's astronomy program because it didn't accept women, a policy in place until 1975. Instead, she studied at Cornell and Georgetown — where, she notes, she started her Ph.D. program at the age of 23, with one young child and another on the way. She was the first woman allowed to observe at Caltech's Palomar Observatory, the Carnegie Institution says. Rubin, who was elected to the National Academy of Sciences and awarded the National Medal of Science, continually pushed for women to be admitted to scientific institutions and organizations. "1) There is no problem in science that can be solved by a man that cannot be solved by a woman. "2) Worldwide, half of all brains are in women. "3) We all need permission to do science, but, for reasons that are deeply ingrained in history, this permission is more often given to men than to women." Rubin also advocated for scientific literacy in the world at large. "We need senators who have studied physics and representatives who understand ecology," she said in a commencement address in 1996. And — appropriately for a woman whose most famous discovery is an enduring mystery — she expressed a deep appreciation for all that remains unknown about the universe. "No one promised that we would live in the era that would unravel the mysteries of the cosmos. The edge of the universe is far beyond our grasp," she wrote in her book's preface. "We have peered into a new world and have seen that it is more mysterious and more complex than we had imagined. Still more mysteries of the universe remain hidden. Their discovery awaits the adventurous scientists of the future. I like it this way."